Hi friends! I have a fun new alphabet printable for you today. 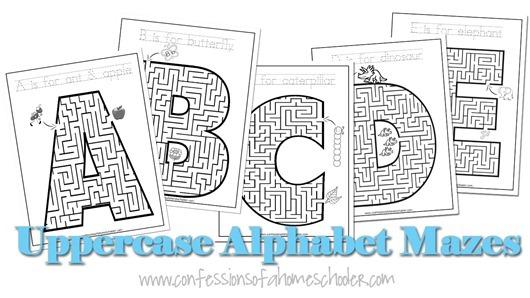 I recently created these Uppercase A-Z Alphabet Mazes that coordinate with my Letter of the Week Preschool and K4/5 Kindergarten Curriculum, and best of all their free! YAY! Each worksheet includes a challenging, but not too difficult maze for your students. They also include short traceable sentences to go along with the maze for additional handwriting practice! And students can also color in the fun images that coordinate with each letter as well. You can print these and use with pencil, marker, colored pencils, or crayon to complete the mazes. Or to make them re-usable you can place the worksheets in page protectors and use them with dry-erase markers. Hope you enjoy my Uppercase A-Z Alphabet Mazes! They coordinate perfectly with my Letter of the Week Preschool and K4/5 Kindergarten Curriculum! Feel free to add them into your lessons as you go through each letter! And don’t worry, the coordinating lowercase alphabet mazes will be coming next week! Is my Letter of the Week Preschool Curriculum a little too easy for your student? Are you ready for something a little more challenging? Then the K4/5 Kindergarten Curriculum is for you! The K4/5 Kindergarten Curriculum is geared towards kids ages 4-5 who are kindergarten ready and want a fun hands-on kindergarten curriculum. It covers beginning reading and phonics skills as well as basic math addition, subtraction, and skip counting skills and more! Thank you for sharing. My toddler is just starting to figure out mazes and these will be perfect for him to try. Thank you for sharing. My 3 year old is going to love them. I’m finally blogging about what I do with my lil’ guy. Woo hoo! I’d be honored if you might take a peek at the start of this crazy adventure. “Because I’m a volunteer docent at a world-class museum in Chicago, we were already frequenting the amazing array of museums here in our city. As Elliot and I began really focusing on skills, goals, and content in our day-to-day lives, I realized we were doing something without even realizing it. We were making the museums his classrooms, and basing the rest of our educational activities off of our visits. Hey, I thought. This isn’t a half-bad idea. You could, maybe, make a whole homeschooling system off of this. A kid could have frequent museum visits as the structure and scaffold of their entire education. Hi! I enjoy reading your blog and have a question for you. I just received an anonymous comment on a two year old blog post saying that he would like to do something disgusting with my little girls. Have you ever received a comment like that? What can be done? I’m so sorry, no I haven’t gotten any comments like that however you should be able to ban that user from commenting from your site at least. I also try to be really careful as to what pics I take of my kids. For example always clothed, no pics in bathing suits or sitting on beds, etc. I do my best to make sure my pics are not enticing in any way for people like that. Unfortunately if you put your kids out there, you take that risk. I’m just starting out on this journey with my youngest. She has special needs, so being able to take things at our own speed is very important. I was wondering where to find the lower case letter mazes, though. It’s going to be a little bit before she’s able to control her hands enough to do them correctly, but seeing the letters to get familiar with them is our focus right now! I’m so excited to get her started on your curriculum! Thank you so much for all you’ve done and offered! 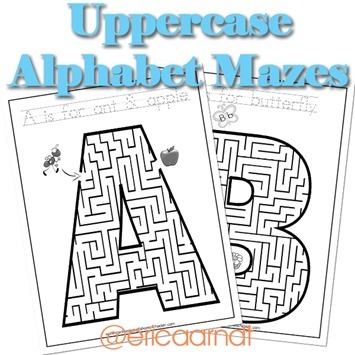 I can not get the Uppercase Mazes to download could you please help me out I really love these and i know my granddaughter will to. I’ve downloaded the lowercase just fine I don’t understand why the uppercase won’t work. Please help love all your stuff. If they won’t download by clicking the link, then try RIGHT clicking then select ‘save link as’ and it should download the pdf to your computer.